I very rarely do the “I’m going to watch [some movie] in honor of [some actor/actress/director]’s passing” thing. It just seems kinda weird and bandwagon-y, and more about the person doing it than the person allegedly being honored. But when Juanita Moore died yesterday, I felt it was an opportune occasion to revisit this movie and show it to my girlfriend in the process. One, because I’d been meaning to anyway (the last time was over 5 years ago) and two, because it tied in nicely to the last film we watched, The Joy Luck Club, which is also about mother-daughter relationships. And it holds up beautifully. Maybe even better than All That Heaven Allows, which is now barely holding on to its position as my favorite by Douglas Sirk. It’s a world-class tearjerker, and both of us were weepy at the end. While the Lana Turner/Sandra Dee plot is presented as the primary story, it’s really all about Moore and Susan Kohner. Both actresses turn in stunning, rich, nuanced performances. Moore especially. Annie is a woman you want to know and to love… you want her to have your back, and you want to have hers. Sarah Jane is a character who you can’t help caring about and sympathizing with despite her raging self-hatred and resentment of Annie. It’s an incredibly complex look at racial issues in a time when the subject matter was rarely discussed at all, much less with such eloquence. When Sarah Jane has her mocking masquerade in front of Lora’s guests, even though it’s childish and rude, you think “Right on!”. And seconds later, when Lora and Annie chastise her, you think “You tell her!”. But it’s never that simple on any side of the issue. 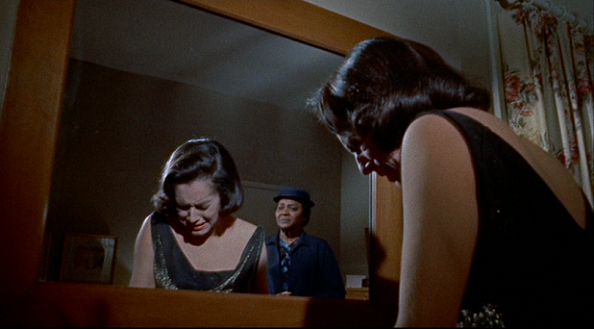 Sirk recognizes the insidiousness of racial prejudice, even in subtle, unconscious ways. And he recognizes that are good ways to approach it and bad ways, with lots of grey area in the middle. And I love the beautifully understated delivery by Moore on the line “Why, Miss Lora, you never asked” when Turner expresses surprise at Annie’s rich social life outside of the home. It speaks volumes. By contrast, the Lora/Susie story feels a bit toothless and superfluous, but there’s some complex issues being tackled there too. Lora defies Steve when he tries to pigeonhole her into the housewife role, rightfully standing up for her right to follow her own ambitions. It’s a bold statement for 1959. But again there’s another side to it, as her ambitions have made her existence an “imitation of life”, struggling to reach career heights while neglecting those close to her. And as cloying as Sandra Dee can be, Susie’s story has its own heartbreak, the pain of unfulfilled adolescent fantasy, so ready to be an adult but stymied by a world that cannot see her as anything but a child. This entry was posted on January 3, 2014 at 11:13 am	and is filed under Movie Reviews. You can follow any responses to this entry through the RSS 2.0 feed. You can leave a response, or trackback from your own site.